In this increasingly Internet based streaming age a good quality network player is a must. I used a Stream Magic V2 for some years, have had experience with it's successor the CXN and when I decided to upgrade I stuck with Cambridge. 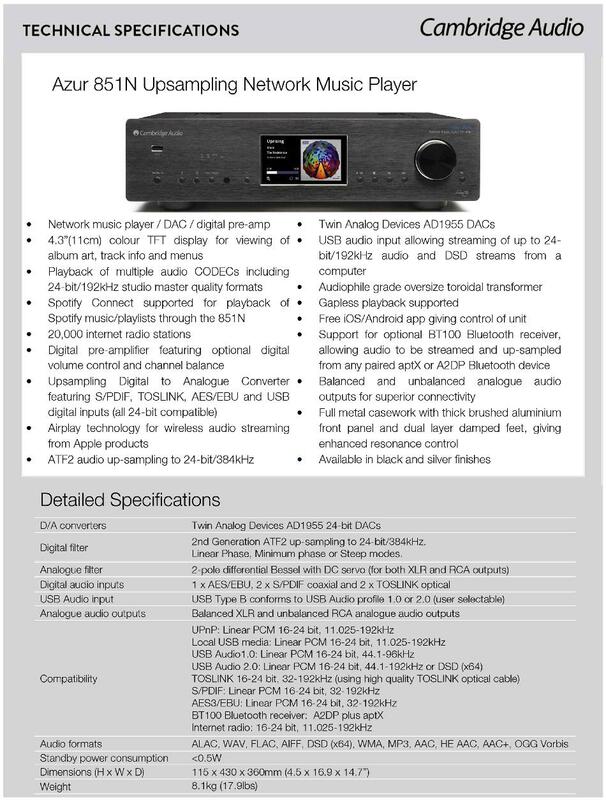 As is usual with Cambridge Audio products they are well designed and built to a high standard. The controls are solid in feel and my only gripe is that you end up winding the circular control endlessly to scroll through your music collection. Presentation is the usual Cambridge Audio excellent. It's well boxed, plenty of foam inserts for protection and comes in a cloth sleeve. The remote works very quickly and smoothly and has the ability to control other Cambridge products - so plenty of buttons. My only gripe with Cambridge remotes is that the underside is curved with stabilizing protuberances at the front but not on the bottom so the thing rocks if you try to press a button without picking it up from the table. Even though my transport is from the CX series the Azure 851n remote works both, a very nice feature. All software and firmware upgrades are via the Internet connection and no fiddling about looking for upgrades, the 851n when switched on notifies you. Easy as pie and seamless in operation, a very nice feature! The 851 replaces my Stream Magic V2 player which has done duty for some years without any problem. Some of the differences are minor one of the welcome ones is an extra USB port. There is a change in DAC to Dual Analog Devices AD1955 24-bit from the Stream Magic 6 V2 and CXN's Wolfson WM8740 24-bit ones with all three up sampling to 384 kHz. Apart from Internet Radio stations TIDAL and Spotify are supported. I use both a server running Squeezebox Server and plug in hard drives and the Cambridge Connect app plus the front panel controls also work seamlessly. So far the biggest hard drive I have tested is a 8 TByte and no delay was noticed when the drive was plugged in - it just showed up on the app. Music selection is a matter of short press and a menu opens up with various options. There is also a Digital Pre-amp mode - read volume control - which I run all the time as it's needed when I use either the Leak or my Triode amps but not when the TacT/Lyngdorf integrated is used. Via the front panel there is a Balance control also. Now to the front panel and the filter settings. The settings are subtle but cycling through them you eventually end up with your preference. Another feature not mentioned in the section of the filters is that if you press and hold the filter select button the phase of the signal inverts, again your choice! The difference in sound from the Stream Magic 6 V2/CXN v the 851n. Slightly more detailed and more refined (which is a way of saying it's hard to describe!!) but enough of a difference that makes it a worthwhile choice if you are looking at a new streamer, not so much if you upgrade as I did. I had the opportunity to compare directly a CXN against a very expensive valve DAC with Gold plated front panel and the CXN was more listenable, more satisfying musically and the 851n is an upgrade on that. Cambridge certainly have hit the right spot when it comes to the 851n streamer, it has a multitude of abilities, is well built and support from Cambridge is excellent. I sent them an email with my comments on the curved underside of the remote and I got an immediate automated reply with a personal email the following day to discuss my concern. 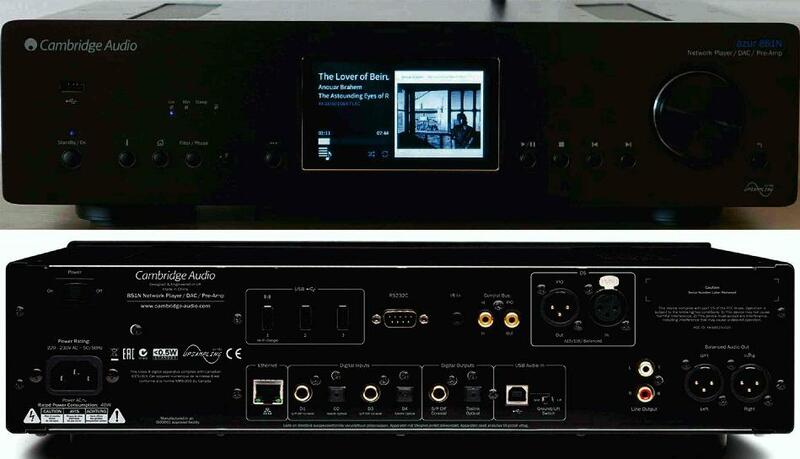 The streamer was fed into either a TacT/Lyngdorf 2175 SADI or Leak Stereo 20 or Parallel 300B SE Triode amplifiers using different speaker systems. I have no hesitation in recommending this product and in fact if it was stolen I would not even be tempted to try something else. I value realism or fidelity in my playback system and it's going to be very hard to better this at anything like the price in my opinion.